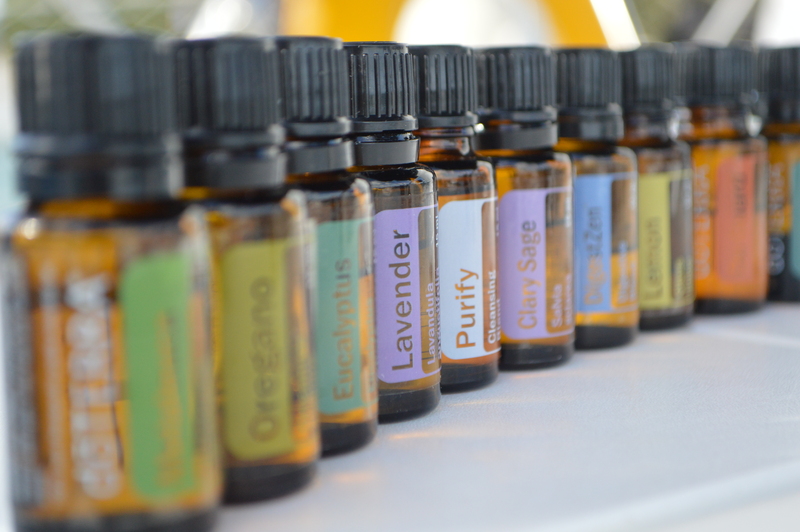 I’ve been wanting to get a blog post out for awhile about my love for essential oils. Since we’ve been here for another week in Miami waiting for safe weather to cross over to the Bahamas, I finally have the time to write this post. I have fallen in love with essential oils and their medicinal benefits over the last two years. The more I learn, the more I love them. My favorite brand of essential oils is DoTerra and here is a description of essential oils from their website. “Essential oils are natural aromatic compounds found in the seeds, bark, stems, roots, flowers, and other parts of plants. Essential oils are very clean, almost crisp, to the touch and are immediately absorbed by the skin. 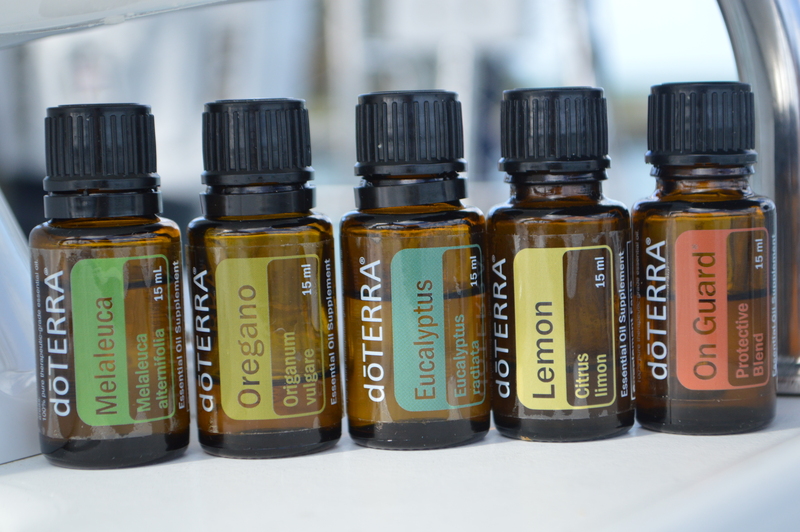 I’ve found that quite a few liveaboard sailors have essential oils on their boats. I’m not surprised since most liveaboards seem to have some hippy qualities in them. I use essential oils for all sorts of things, but mostly to make my boat smell good. 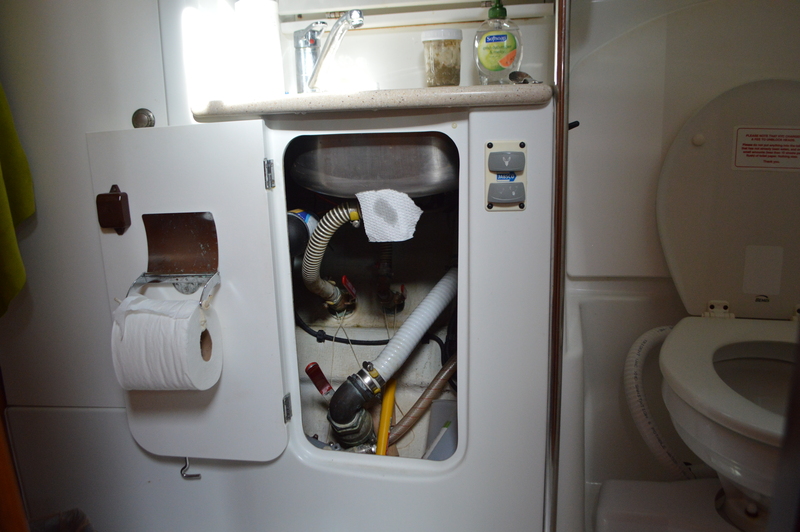 With tight quarters and two heads that fill up quickly, I really value a clean smelling boat. 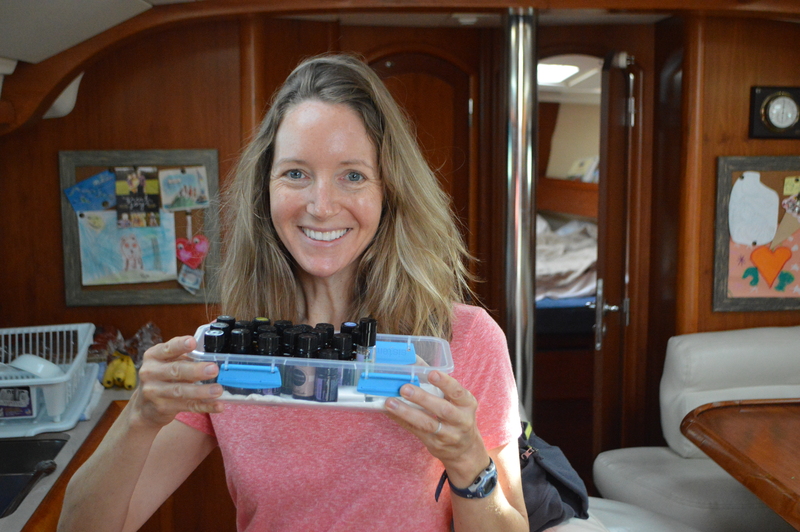 The essential oils I have on board keep the head, trash can, and berths smelling clean and fresh and that makes for a happy First Mate. Every day I put a few drops of lavender or sweet orange on a small piece of paper towel under the head sink where all the stinky hoses lie. Voila!…a clean smelling head. See photo below. My kids also love the smell of essential oils and are constantly asking for them. I’m so proud. I add a few drops of Melaleuca (Tea Tree Oil) to water in a spray bottle to fight mold and mildew which is common on boats. I use Cinnamon Bark in my sink when I do dishes to kill germs. I also use essential oils on my three kiddos whenever they are sick. Here are my five go-to oils when they have a cold, the flu, or any other funk. Melaleuca, Oregeno, Lemon, and OnGuard (a combination of Wild Orange, Clove Bud, Cinnamon, Eucalyptus and Rosemary) all are strong fighters of bacteria and viruses and help the immune system. I use Eucalyptus when my kids have a lot of mucus or a bad cough. I use specific essential oil blends for stomachaches, headaches, muscle aches, and insomnia. I make my own toothpaste, deodorant, and sunscreen. I use essential oils in all three of these recipes not only to make them smell good but for fighting bacteria which is important for the mouth and underarms! Here is a photo of my toothpaste which looks weird but tastes pretty good. A great website for researching essential oils and their health benefits can be found at www.everythingessential.me. At this website you can also look up a health concern/ailment and it will tell you which essential oils can help and how. Happy smelling! Update: We will raise the anchor at 3:00 am this upcoming Monday and sail about 8 hours to Bimini. You can follow us Monday morning on our “Current Location” page to see where we are. The harbor we are anchored at is packed with sailboats that are all getting ready to make the crossing on Monday. There should be about 15 to 20 other boats making the crossing with us. Do you have a book you’d recommend for reference? I’ve been increasingly interested in oils, but am very very new. I’d love to have a hard copy to reference when I can’t get online. Kelley, I’ll get back to you on a book. But first…did you know we met your husband while we were sailing in the Bahamas? My email is jenkonesco@yahoo.com. Email me your email so I can send you a cute photo of my little daughter with your hubby at Palm Cay Marina!!! I wish to know the process of making the sunscreen, as I already know how to make toothpaste and balms for various purpose. can you please share it in some future blogpost? Jen you are such a hippie now… I love it! You guys have me a few essential oils to experiment with before you left and I need to learn more about them. Interesting post! Safe travels as you leave tonight. Thinking about you guys all the time! I have used peppermint oil for a headache (rubbed where the back of the head and neck meet) and haven’t had a Excedrin (or similar) for over 8 years! I love Essential Oils as well. I’ve been learning about them this winter. Glad you are all gearing up for the crossing! Exciting to be going this time as a group!! Oh how fun. Yes, learning about essential oils is fascinating. Hey, when is your next Scuba trip?